請到:https://goo.gl/L8FJEd填寫， please fill out this survey. Drupal Frontend Development Workshop (Drupal前端開發工作坊):第一堂課: CSS Component design - BEM naming convention將在03/18舉辦，有興趣者，請到https://goo.gl/IWgYza 完成報名手續。將由資深Drupal前端開發工程師開講，John Wilkins (Drupal ID: JohnAlbin)，有10年經驗的John，在各大DrupalCamp及DrupalCon都有演講過，這次，他想要把他的經驗用工作坊的方式分享給大家，採用小班制，會更精準，更細節化。 Drupal Front-end Development Worshop: CSS Component Design - BEM naming convention will be held on 03/18 from 19:00 - 22:00. Our speaker, John Wilkins (Drupal ID: JohnAlbin), is an experienced Drupal developer. 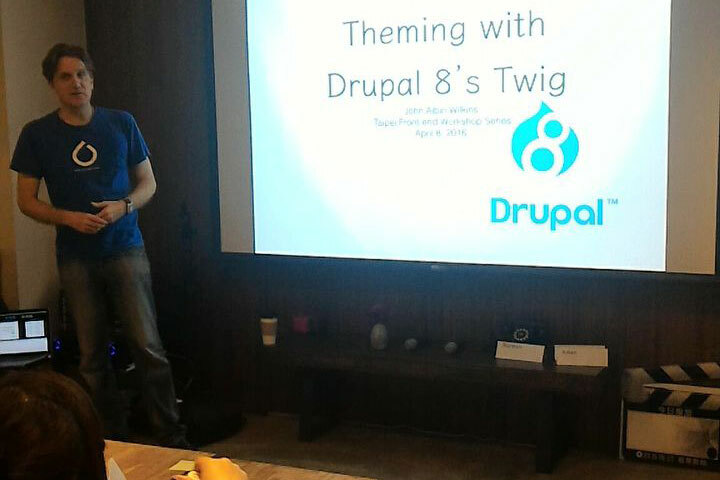 He has been working with Drupal for over 10 years now. He has been given talks at numerous DurpalCons and DrupalCamps everywhere. Since he lives in Taiwan, he would like to spread his knowledge further and decided to hold a series of workshops. This workshop will be the first one of a series of 4. If interested, please fill out the registration form at https://goo.gl/IWgYza.